So today…started not so great, but ended fairly well. If you haven’t noticed, Hurricane Sandy is rapidly approaching, throwing cold rain all over Ohio, even though we are about 500 miles from the Hurricane. I feel even worse for my friends in DC (best friend), New York (J’s fam) and Pennsylvania (my big sis) who are getting even more of the Hurricane. Needless to say, it is pretty gross outside. I am cold. I needed dinner. What to make? Hash browns. I bought a bunch of potatoes two weeks ago to make mashed potatoes when J was here, but now find myself with four or five leftover. Put some olive oil in a frying pan-heat for a minute, not too hot! Spread potatoes out in pan- thin layer so they cook evenly. Season with salt and pepper -not too much! Eat. I had mine with scrambled eggs. I like mine with ketchup. 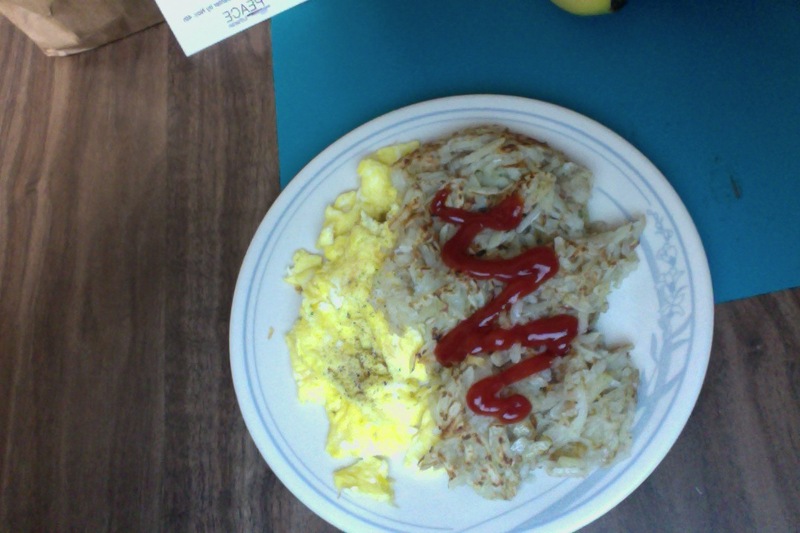 Clarification- not ketchup on the eggs: gross. Seriously. My happiness levels went up with dinner. Well, that and the skype date during dinner with J.
Ok- we are almost there. Tomorrow marks 50 days until J comes home! 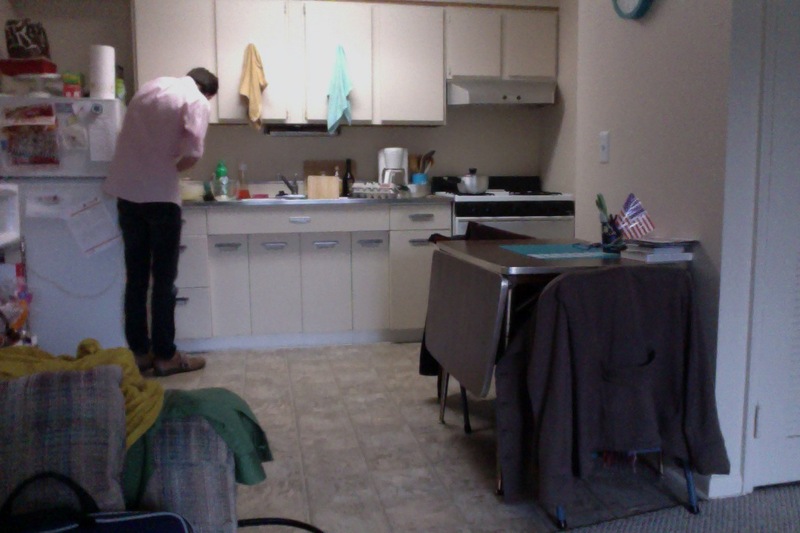 This may seem really silly, but it seems to be getting harder the closer we get to him moving back to our humble apartment. Luckily, he is visiting soon for a four-day weekend. But, still…all I am saying is after you see each other approximately everyday for 6 whole years, going without each other for 6 months is killer. People keep telling us “that’s not that long,” but it honestly feels like another 7 years that we have been apart…Anyway, enough moping. Here’s hoping the next 50 days fly by! So, I have hit a point where I have a lot of random leftovers or random ingredients in my fridge. 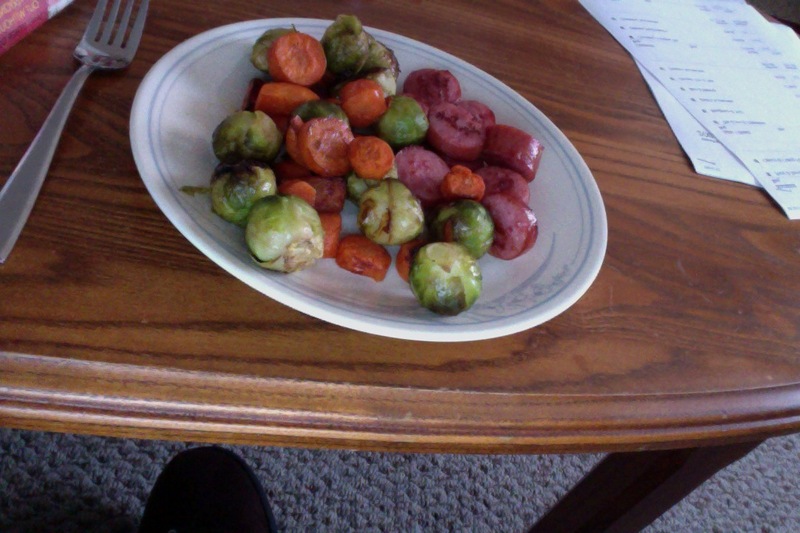 Today, I had a bag of frozen Brussel sprouts and a bag of whole carrots. What to do? Roast them. On a foil lined cookie sheet, I tossed the sprouts and carrots (which I cut into 1/2 coins) in some olive oil, balsamic vinegar, salt and pepper. Roast at 400 degrees for 20-30 minutes. I flipped them every 10 minutes to make sure all sides got nice and toasty. While that was roasting, I sautéed a smoked sausage in a frying pan, browning up the slices I put in the pan. Plenty left for tomorrow’s dinner too! Another crazy week here- hope all is well with our readers! 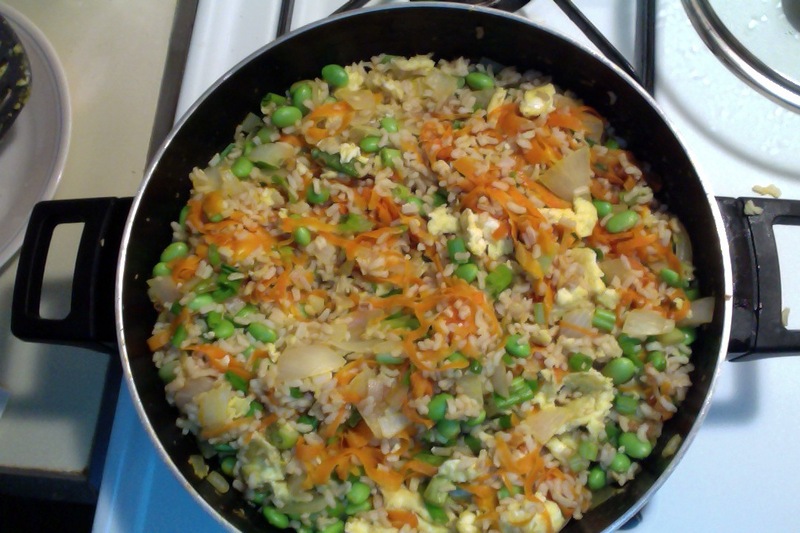 Too lazy to order out, so I made my own fried rice. I made this for dinner tonight. I finished my last day of jewelry club at school, had a long day of meetings and teaching. Was a bit tired. What solves a lack of dinner plans, with a lack of care whether the food is healthy or not? Chinese food. BUT WAIT. This is healthier. Once heated through, add green scallions and soy sauce. Stir once more. Eat. I added a little more soy sauce on top.